To celebrate Manufacturing Day 2017, several local businesses and Davie County manufacturers provided a unique opportunity for all eighth-grade students in Davie County. Davie County participated in National Manufacturing Day for the first time this year through the collaborative efforts of the Davie County Chamber of Commerce, Davie County Schools, Davie County Economic Development, DCCC and the Davie business community. On October 6th, students from Ellis and North Davie Middle Schools each toured two different locations including DEX Heavy Duty Parts, Dunlop Aircraft Tyres, Ingersoll Rand, Pro Refrigeration, DCCC – Davie Campus, WFBH-Davie Medical Center – Bermuda Run and the Davie Construction – Dragonfly House construction site. South Davie students toured Ashley Furniture and met the company’s Founder and Chairman of the Board, Ron Wanek, on October 12th. Many of these students had attended Mocksville Elementary and written to Wanek asking him to locate his new manufacturing and distribution facility in Davie County. They got to experience the fruits of their labor first-hand. Approximately 500 students and staff were exposed to the many outstanding career opportunities that exist here in the county. Business leaders provided informative tours including examples of how their employees use math, science, technology, and communication skills. Students were intrigued with the emphasis on safety, size of the facilities, variety of jobs including the educational requirements for the job, and the machinery used in the day-to-day operation of the businesses. 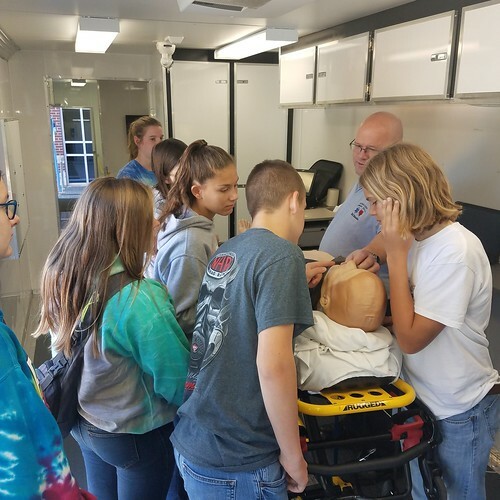 DCCC showcased its many educational programs through informational stations as well as tours of its mobile labs, a fire truck, and a tractor trailer used for the truck driving program. Hosted annually, Manufacturing Day is a national event executed at the local level and typically focuses on manufacturing careers. “We expanded the types of businesses students visited to better align the many opportunities available here in Davie. With a newly opened state-of-the-art medical facility in Bermuda Run, expansive career path offerings at DCCC and the opportunity for a comprehensive tour of an active construction site, our event was truly a “career exploration day” for our students,” said Carolyn McManamy, President of the Davie County Chamber of Commerce.